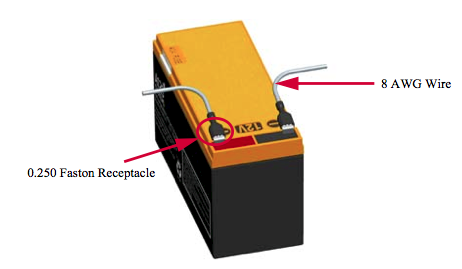 The A123 Systems ALM 12V7 Part Numbers 400520-001 and 400520-009 when mounted in series configuration requires a 13.8V charger to be connected to each individual battery in the event a fault condition is tripped which results in the terminals being placed in a high impedance mode to protect the battery as part of its normal mode of operation, such as (UVP) Under Voltage Protection, (OVP) Over Voltage Protection and (OTP) Over Temperature Protection. Upon connecting the charger, the battery will detect the 13.8V charger and will “wake-up” activating its terminals. A123 Systems has designed new ALM 12V7 Part Numbers 400520-201 and 400520-209 which allow the charger to be placed across the entire series string (13.8V x the number of ALM’s in series) to wake up all batteries simultaneously in the event that a fault condition occurs that puts the terminals in a high impedance mode. The new Part Numbers are available now. NOTE: A123 Systems ALM 12V7 modules can be connected up to 4 in series and up to 10 in parallel with no additional control circuitry required. The following information is taken from the A123 Systems ALM 12V7 Users Guide which is available fordownload. You can arrange A123’s ALM 12V7 battery modules in series and/or in parallel to achieve higher operating voltages and capacities for your intended application, with a maximum configuration of 4S10P. An external BMS or other electronics are not required to configure multiple ALM 12V7s. CAUTION: Do not short circuit the ALM 12V7. This blows the 30 A user-replaceable fuse. Connect the ALM 12V7 modules using 8 AWG wire and any receptacle that fits a 0.250” by 0.032” Faston terminal tab. The 8 AWG wire is necessary to carry the maximum current allowed by the user-replaceable 30 A fuse in each module. Refer to Figure 5-1 for an illustration of the components used to connect multiple ALM 12V7s. NOTE: Do not connect ALM 12V7 modules to battery modules of other chemistries or ALM modules of different capacities. For example, do not connect an ALM 12V7 to a lead-acid 12V7. The modules can be combined together in series strings to achieve higher operating voltages by connecting the positive terminal of one module to the negative terminal of the next module. The maximum number of ALM 12V7s you can connect in a series is four. 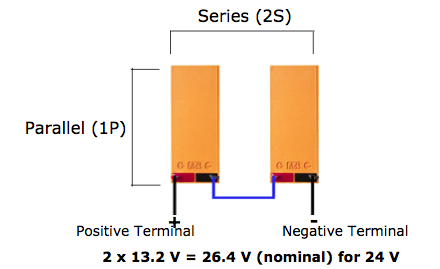 Figure 5-2 illustrates two ALM 12V7s connected in series, for a 2S1P configuration. You can combine modules together in parallel strings to achieve higher operating power and/or energy by connecting like-polarity terminals of adjacent modules. To combine modules in parallel strings, connect all like- polarity wires on adjacent modules to an appropriately sized terminal block for your application. Reference local electrical codes for terminal block specifications. Refer to Figure 5-3 for an example of eight ALM 12V7 modules connected together in a 4S2P configuration. With certain restrictions, the ALM12V7 can support paralleling for added discharge current. These restrictions are described below, and depend upon accurate balancing which typically requires fairly lengthy charge periods to ensure. 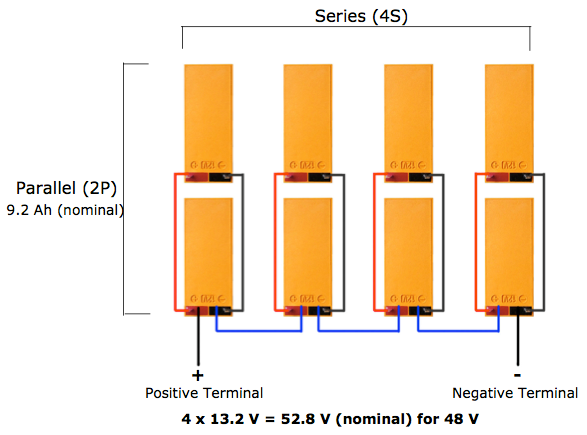 If impedance, capacity, or self-discharge rates between cells vary significantly then FET failure may occur regardless of how well you adhere to these instructions. This is because the overvoltage and undervoltage protection mechanisms operate based upon individual cell voltages and unfortunately you can only monitor and respond to terminal voltages. Therefore these provisions for paralleling for added current assume that all cells the same way. Otherwise, the FETs may open unexpectedly which could lead to the failure modes previously described. Before wiring multiple ALM batteries together, all batteries must be individually charged to 100% SOC using a 10 A current limit. To ensure that 100% SOC is reached, a 14.4 V charge voltage should be maintained for at least 4 hours. Connect batteries together in a configuration not to exceed 4s10p (4 in series, 10 in parallel). The entire group of batteries should then be float charged at a 10 A current according to the number of series elements (14.4 V for 1 s, 28.8 V for 2 s, 43.2 V for 3 s, or 57.6 V for 4 s). This float should be held for at least 24 hours to allow the batteries in the system to fully balance. To recharge the group, repeat the process starting at step 3. This will ensure that all cells are once again properly balanced in preparation for the next discharge. * If operation below 23 °C is required, you should adhere to a current ramp rate of no more than 10 A per second to prevent sudden dips in pack voltage that could lead to inadvertent activation of the UVP mechanism. Paralleling for higher charge currents is not supported at this time. 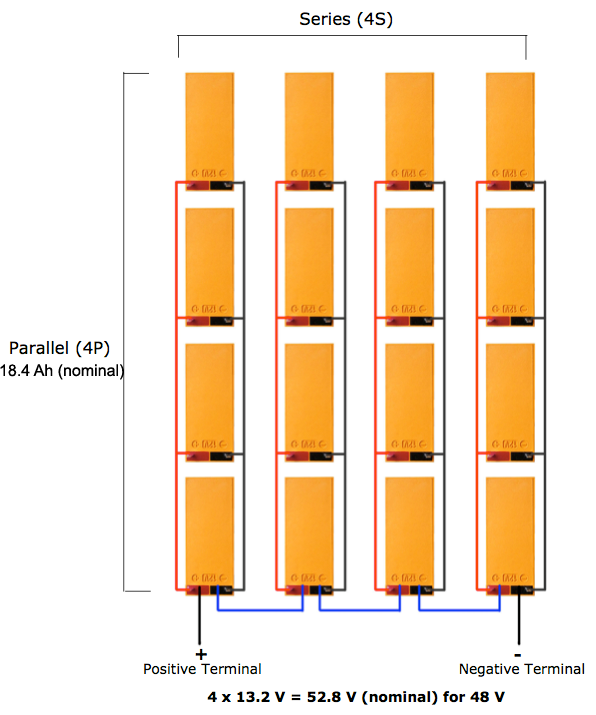 Figure 5-4 illustrates a larger configuration of ALM 12V7 modules arranged in series and parallel. This configuration features four series strings and four parallel strings (4S4P).